"hip. vegan. gourmet." these are the words that describe karyn's cooked, a vegan spot in river north near the corner of chicago ave. & wells st.
the karyn's cooked websites notes, "we do consider this to be a vegan restaurant. however, some dessert items do contain honey & we do use organic raw honey from local beekeepers." i know honey is a topic of debate among some vegans ... so it seems strange to me to characterize the restaurant as "vegan" when they use ingredients that don't always fit the description. oh well! anyway, i recently dined there with a lovely blog reader, mikie ... i can only speak for myself, but i had a great time and did really enjoy the food at karyn's. 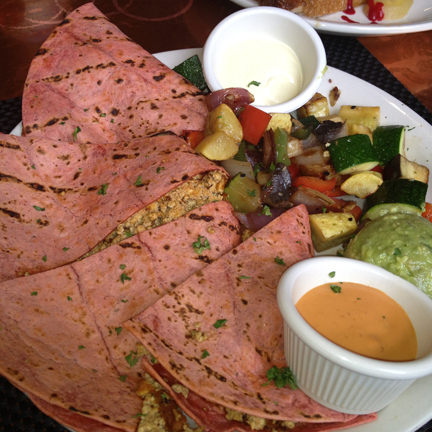 extremely spicy mexican seasoned tofu in a tomato tortilla, served w/ a side of guacamole, oven baked vegetables & chipotle sauce. we both ordered this off the brunch menu. mmm. the sauces were delicious. the white was a garlic sauce (we think? the menu called it soy cheese) ... but i preferred the chipotle. it was quite tasty on the roasted veg. my only complaint is that there was no vegan cheese in the quesadilla. it fell apart -- and i think some faux cheese would have held it together nicely and added a perfect taste & texture. 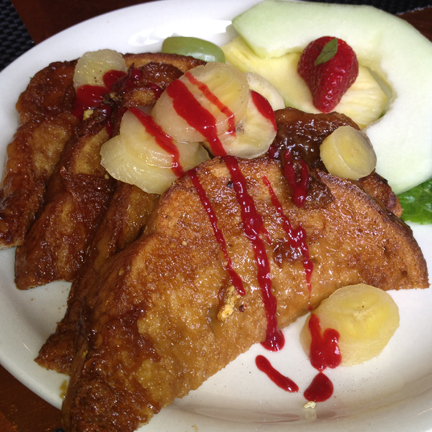 coconut milk battered french toast glazed w/ cinnamon sugar & topped w/ sliced bananas, raspberry coulis & maple syrup. this.is.amazing. french toast perfection. and plenty to share. i was never a huge french toast fan (even before i became vegan) ... so this was literally the best version i have ever had. you could really taste the coconut milk. and mikie & i kept commenting on how perfectly thick cut the bread was. yum! this is definitely the kind of dangerous/delicious vegan food that should be reserved for special occasions and/or eaten infrequently. yum. karyn's cooked is another dining establishment that is a must try for vegans. the brunch menu is awesome, but smaller than their regular lunch/dinner menu. so keep that in mind. either way, it's a great spot.